In 03- Metasploit Basics- Attacking the Browser, we saw how to attack perform attacks against both the Internet Explorer and the Firefox browser, both in Windows and Linux operating systems. Attacks against users using these browsers does not have to be limited to just attacking the browser itself, and we later expanded our knowledge to attacks on Adobe Flash in 05- Metasploit Basics- Attacking Flash. 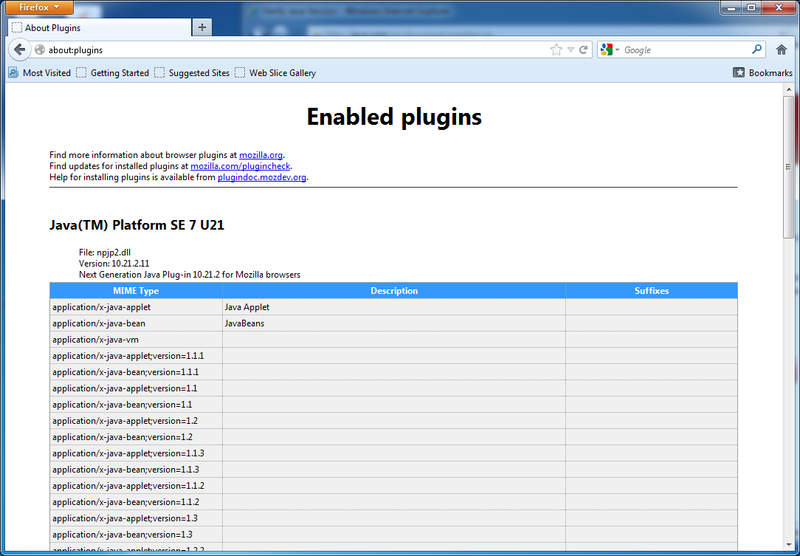 Another common attack target in browsers has been the Java plugins. Indeed, during a stretch of 2012 and 2013 it seemed that a new Java attack was released almost every month. In fact, that stretch only saw nine public attacks. OK fine, ten is a lot in such a short period of time. By late 2013 though, Oracle seems to have gotten the problems under control, and we have not seen a new Metasploit module for Java since late summer 2013. Mind you, that can change quickly…. Let’s take a look at these various attacks, from the oldest to the newest. Vulnerable: Java 6, Update 16 and earlier. Note: The module states that it has only been tested on a few versions of Java, and only against Windows XP SP3. Vulnerable: Java 6 Update 27 and earlier; Java 7 (no updates). Vulnerable: Java 6 Update 30 and earlier; Java 7 Update 2 and earlier. Vulnerable: Java 6 Update 32 and earlier; Java 7 Update 4 and earlier. 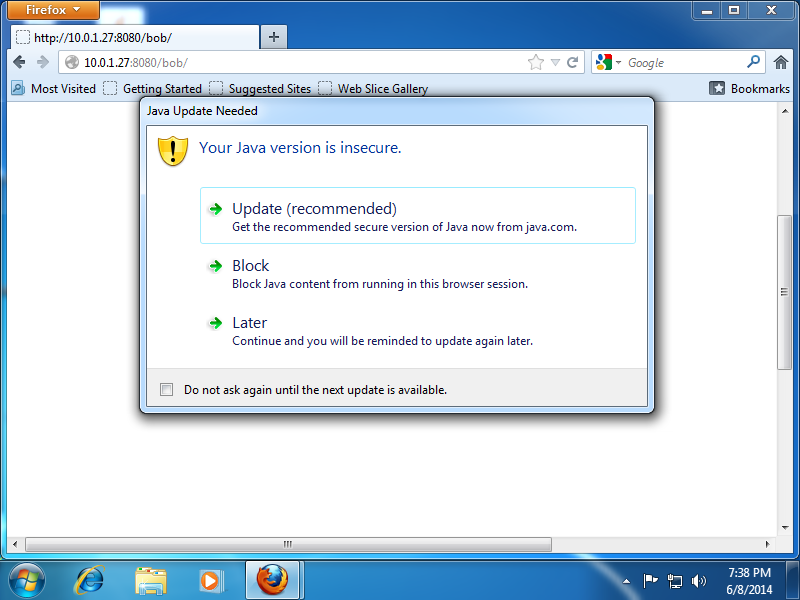 Vulnerable: Java 7 Update 7 and earlier. Vulnerable: Java 6 Update 41 and earlier; Java 7 Update 15 and earlier. Vulnerable: Java 7 Update 17 and earlier. Vulnerable: Java 7 Update 21 and earlier. Let’s demonstrate a few of these modules against a few different targets. To set up the targets, we are going to need to get old versions of Java. You can get them directly from Oracle. I have had good luck though, getting them from other sites, including Oldapps.com and Oldversion.com. One advantage of these sites is they ability to do a bit of one-stop shopping, as they have older versions of a wide array of software. The downside is the fact that they seem to try to get you to click on one or more of their ads, typically by making them look the download button. Try it and see- you may never have seen the word "Download" in so many boxes in one place! The problem with this approach is that you need to check each different browser somewhat differently. Instead, you can head over to Oracle’s Java verification page and see what Java thinks you have. One warning though- because of all of the vulnerabilities in Java, they have become quite aggressive in their attempts to convince you to upgrade to the latest version of Java. Since we actually are interested in testing the older stuff, just be careful that you don’t inadvertently update Java. As our first example, let’s try the latest exploit against Java 7 Update 21 (32 bit) installed on Windows 7 (64 bit); we’ll use our Firefox browser. The exploit set-up is similar to what we have seen in other browser exploits. The big difference now is that instead of using a Windows or Linux payload, we’ll use a Java (meterpreter) payload. The first thing you will notice with the exploit is that after visiting the hostile web site, you are unable to even launch Java from the browser. This is a new security feature in Java that prevents unsigned applets from running on less than the latest version of Java. Let’s disable this feature. 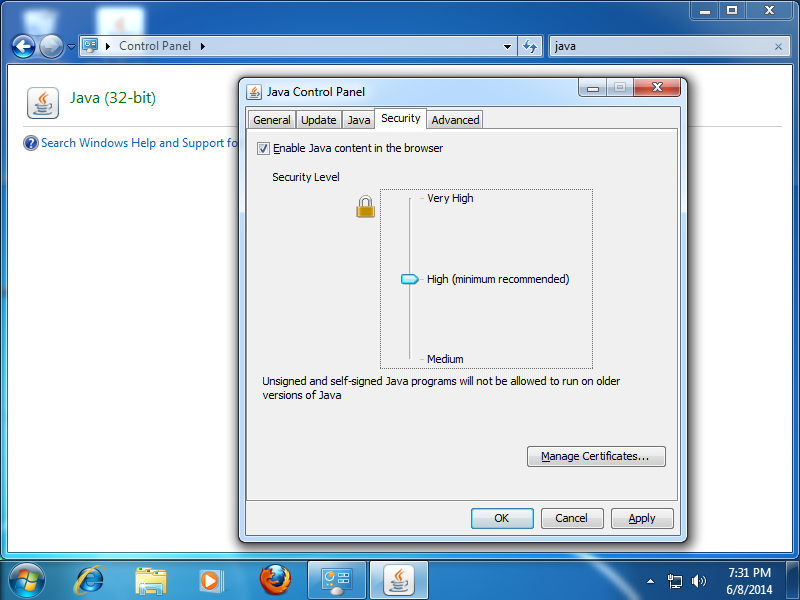 From the Control Panel in Windows, select Java. From the Security tab, slide the slider from the default level (High) to Medium. Be sure that Java content is enabled in the browser. With the settings changed, visiting the web site will first result in a warning that your version of Java is out of date. Clicking to activate the plugin, will then present you with another box stating that your version of Java is out of date and should be updated. Let’s ignore this warning as well. Continuing, you get yet a third warning; this one asks you if you want to run the application. It forces you to manually check a box saying that you accept the risk. You know, I thought the idea was that Java was, you know, sandboxed. Now I feel like I am passing through an airport checkpoint. Now the Java Meterpreter is similar to the traditional Meterpreter. You can spawn a shell, take screenshots, even run programs remotely. There are some noticeable differences though. Java Meterpreter does not migrate between processes, and it does notallow some commands (like getsystem). Although this example used a Java meterpreter for the payload, this is not a requirement. If you change the target from the default to a Windows target, you are able to use a Windows Meterpreter payload. Similarly, if you use a Linux target, you can set up a Linux payload. For example, suppose we have Linux Mint 13 system running Java 6 Update 30. Let’s try the Applet Field Bytecode Verifier exploit, and target it specifically at our Linux system. Rather than use a Meterpreter payload, let’s instead use a Linux shell. Other than lacking a bash prompt, our shell is quite effective. Aww, no mention of the oldest 65534-byte ‘bytecode verify’ bug?